October 27, 2010 -- Arkansas Attorney General Dustin McDaniel was on the Arkansas State University campus Wednesday afternoon to present a check for $33,749 to school officials at the Beck PRIDE Center for America’s Wounded Veterans. (From left) Director of Beck PRIDE Center for America's Wounded Veterans Susan Tonymon; Arkansas Attorney General Dustin McDaniel; Dean of the College of Nursing and Health Professions Dr. Susan Hanrahan; Col. (Ret.) Jerry Bowen, founding member of the Beck PRIDE Center National Advisory Council. The money will help the center to continue its mission to provide specialized personal rehabilitation and education services to injured military service members returning from combat deployments to Iraq and Afghanistan, reach out to a greater number of veterans and increase services to family members. The check was presented to Susan Tonymon, director of the Beck PRIDE Center. Interim ASU System President Dr. Robert Potts, interim Chancellor Dr. Dan Howard, interim Provost Dr. Glen Jones, dean of the College of Nursing and Health Professions Dr. Susan Hanrahan and Col. (Ret.) Jerry Bowen, a founding member of the Beck PRIDE Center National Advisory Council, were in attendance. The funds are the result of a settlement entered into by McDaniel’s office of a consumer protection lawsuit that was filed against American Veterans Coalition. In December of 2007, McDaniel filed suit against the Washington-based American’s Coalition, claiming that it had deceived Arkansas residents during solicitations for donations. McDaniel alleged that less than one percent of the donations raised were actually used to support veterans and “not one dime” had been given to Arkansas veterans. The $33,749 represents the total amount of money donated by Arkansas residents. “We are glad that through our efforts, we were able to fulfill the desires of Arkansans who donated to this organization, and that we can continue to support those who have given so much to defend our country,” said McDaniel. 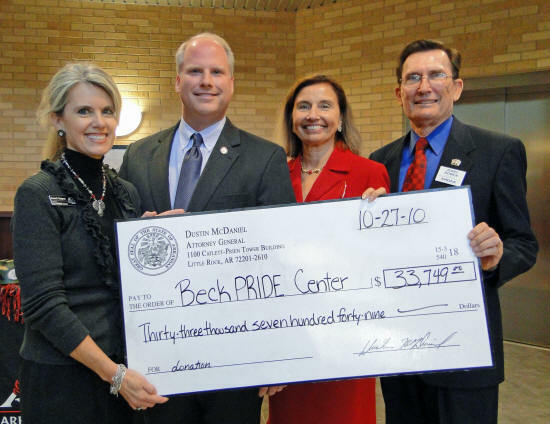 McDaniel went on to say how proud he was to be able to reward the work of the Beck PRIDE Center. Several ASU students who are veterans of service time in Iraq and Afghanistan were on hand for the check presentation. Arkansas State University recently reached a special milestone with its selection as the 10th best higher education institution in the United States and the only one in Arkansas for military veterans by Military Times EDGE magazine. Beck PRIDE Center participants are active duty or discharged military service members and include active and reserve personnel in the Army, Navy, Marine Corps and Air Force as well as National Guard personnel in the Army and Air Force. Currently, there are 108 participants enrolled.